If you’re going to play alphabet tic-tac-toe, you’re gonna need some alphabet letters to play with. So here they are! 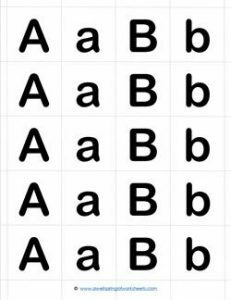 There are five of each uppercase and five of each lowercase letter in a strong bold font. There are nine squares so the first player gets to take five full turns and the second player only four. There are a few different ways kids can play the game. They can use the upper and lowercase of the same letter, uppercase of different letters, lowercase of different letters, etc. Have them say the letters though for more letter recognition practice. Print the letters on cardstock to use over and over. Laminate if desired. These can be used for many other purposes. Just use your imagination!